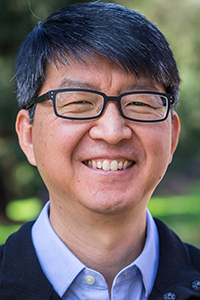 Sung Park is a Senior Instructor of photojournalism and multimedia journalism. He is also co-director of the Journalism Master’s Program at the SOJC. In 2013-14, he taught multimedia storytelling to master’s students at the University of Ghana as a Fulbright Scholar and has taught seminars and workshops for media organizations in West Africa. Before joining the SOJC, he taught photojournalism and multimedia at Syracuse University and The University of Texas. Park has over 20 years of staff and freelance experience doing journalistic and nonprofit work. He was an award-winning staff photographer, picture editor and multimedia producer at the Austin American-Statesman and is currently an active freelance visual journalist. He has been a coach and instructor for the National Press Photographer’s Association Multimedia Immersion Workshop and is a founding co-director of Story-Arc Cinematic Journalism Workshop. He holds two degrees from Syracuse University: a B.S. in Illustration Photography from The Newhouse School and an M.F.A. from the School of Visual and Performing Arts.